We will experience pain and we will experience suffering in our lifetime. It's inevitable, but for those who have the hope of Jesus Christ, it is not eternal. God promises us that pain will not last forever, that pain will diminish and new things will be born from it. He explains it in Isaiah 66. God relates the suffering of Jerusalem to a woman in labor. 7 “A woman does not give birth before she feels the pain. She does not give birth to a son before she feels the pain of birth. 8 No one has ever heard of that happening. No one has ever seen that happen. In the same way no one ever saw a country begin in one day. No one has ever heard of a new nation beginning in one day. just as soon as she feels the birth pains. without allowing something new to be born,” says the Lord. I will not stop you from giving birth to your new nation,” says your God. This promise in Genesis 9 along with the promise in Isaiah 66 is why this verse is so close to the hearts of mothers who are pregnant with a rainbow baby. A rainbow baby is a baby born after a previous pregnancy loss (miscarriage, still birth or infant loss). "David and Bathsheba faced every parent’s worst nightmare. Many of you have faced the same, and my heart breaks for you. Too many of my friends and family members have suffered miscarriages, still births, and infant and child loss. Far too many. To the moms who have buried a child: I want you to know right now that God does not want this. Though this is the way that he punished David, do not think that the death of your child is the direct result of your actions. Do you hear me? You did not cause this! My mom had a miscarriage early on in her marriage to my dad. After they found out, she and my dad drove to the neighboring town of New Orleans with a camera and black and white film in hand. Together, they took snapshots around the city to document the solemn day. Of all of the pictures stored in our family photo albums from over the years, those are the only ones not in color. It documents such a heartbreaking time when she questioned if God was punishing her for something she had done. So many who have suffered that severely question the same thing. However, a few months after she miscarried, she found out she was pregnant again. This time she would give birth nine months later to her rainbow baby, me. without allowing something new to be born,' says the Lord." God has a plan for each of His children, even the ones that we carry for just a short time here on this earth. As we will see in our study tomorrow, God heals and restores. His love for us is so great. It is a greater love than we can ever fathom and we get a glimpse of that love as we hold our children in our wombs and arms. Your babies are safe in His arms right now and one day, you, dear child of God, will see them again." Her Children Arise - a Bible study for moms - is due to release on September 1, 2018. Be sure to subscribe on the home page to get the latest updates on release information. 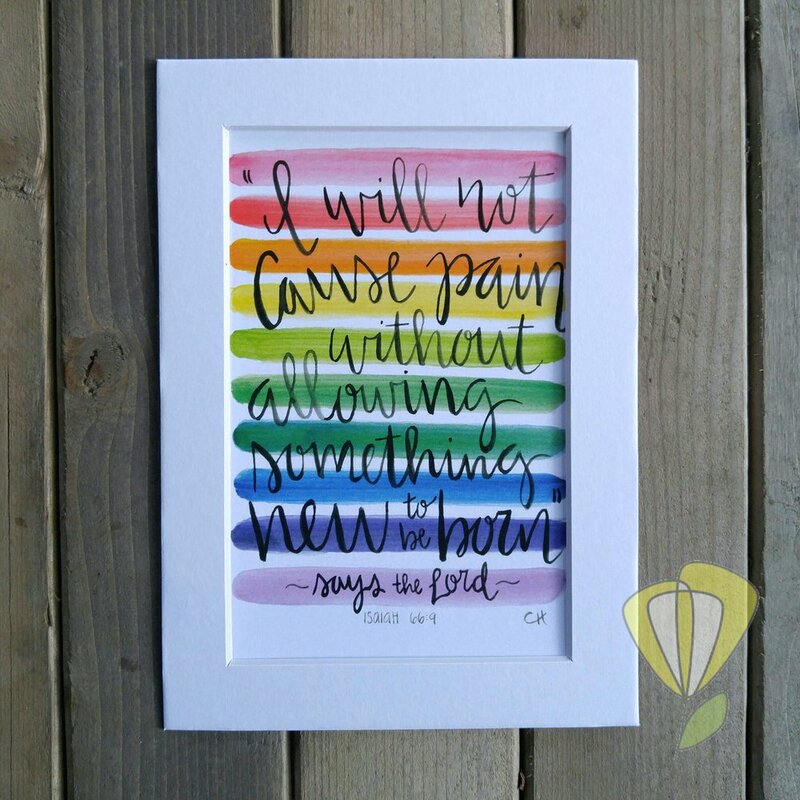 "Something New" 4"x6" watercolor print is available for purchase on Etsy at YellowTulipArt.